If you’ve been following me for a while, you probably know that I like creepy things, such as places where skeletons are artfully arranged and cemeteries. 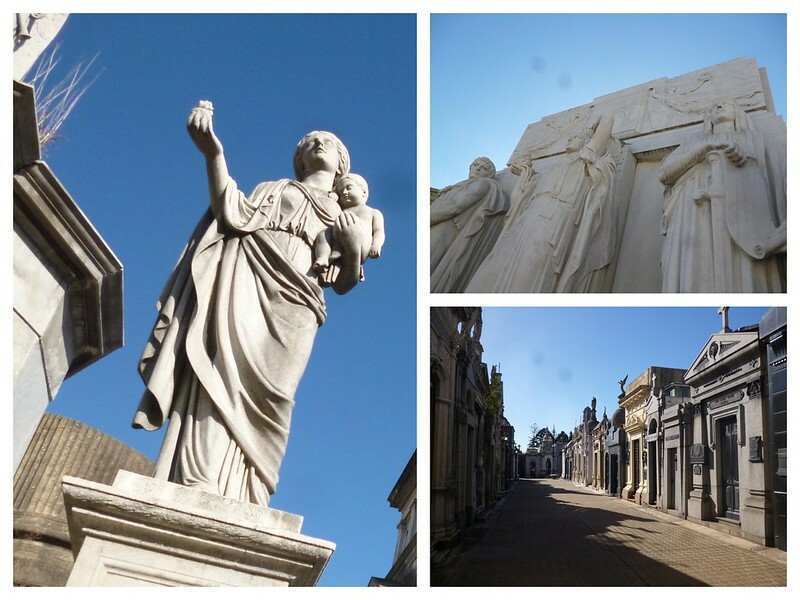 When I learned about La Recoleta Cemetery in Buenos Aires, I knew that I must visit the place. I didn’t have an exact visit schedule so I slotted it in for today. Since Google Maps does not have public transport directions for Buenos Aires, I did the safest thing and walked all the way from my hostel. Good thing Buenos Aires has a grid system. I just needed to walk straight and turn when there is a bend and continue walking. On my way, I stopped by a GIGANTIC Carrefour for a pack of biscuit (in case I get hungry from the terrible hostel breakfast) and a cup of coffee at the Carrefour Cafe. I found out that raw steak is sold at as cheap as A$22, making me determined to make my own steak instead of spending A$80 outside for a restaurant steak. 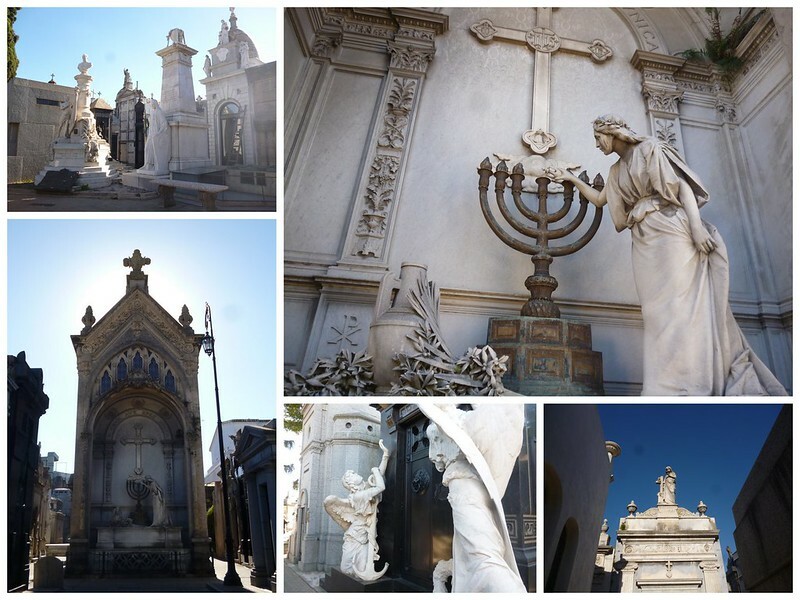 Back to the cemetery… I found it easily since the crosses and angels peeped over the high walls surrounding the resting place. The place was amazing. Larger than life statues were littered everywhere looking mournful. 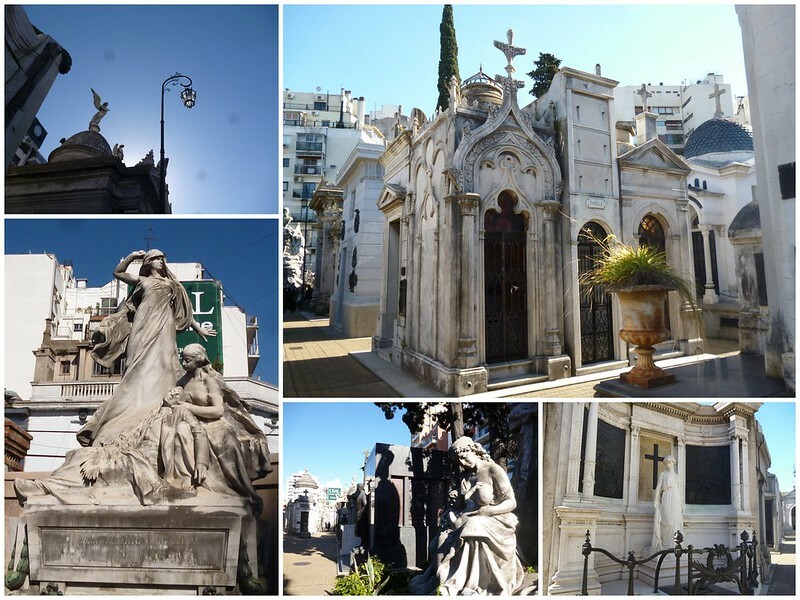 Many of the mausoleums were exquisite. My sister mistook the crosses for churches when I sent her and mom photos of the cemetery. I walked for so long that I decided to take a rest at one of the partly sunny benches. I read through several chapters of Harry Potter and the Prisoner of Azkaban during the wait. At last, it was time for me to leave. Before that, I visited Evita’s grave. It looked more like a small black marble box, not as glamourous as many of the “houses” in the neighborhood. After seeing the cemetery, it got me wondering what people nowadays prefer to be placed after they die. As I walked back from the cemetery, I peeped at the different menus. Alas, everything in proper restaurants cost about A$80 (S$20). I was in my miserly mode of mine so I didn’t go into any of them. In the end, I found a dingy place near my hostel that offered set meals for A$45. I was tempted by the photo of the steak. They said, “Si.” I mimed sitting down and one of the man nodded. The dish took a while to cook. When it came, it was decent but not spectacular. If I wanted spectacular, I should have just gone to the A$80 shops. When it was time to pay the bills, one of the man asked another man something. The other man said what clearly sounded like “30 pesos” in Spanish because the “t” was audible. But the change I got back from the first man was change for A$45. I stared at the bill, turning it over to see it taped down the middle. I could have asked the guy who gave me change, “30 pesos or 40 pesos?” I could do these numbers but it didn’t seem worth it making a scene for what is only S$2.50 of change. I took leave, vowing to have enough guts to confront that swindler in the future. O Google Tranlated “Can I buy a SUBE here?”, memorizing the translation and using a broken version of it to ask for a SUBE. Extra points for understanding the lady’s question of how much I want to load into my card. X Not asking for the correct change during lunch. Thanks for reading this blog. :D What else would you like me to do in Buenos Aires before I fly off this Friday?